Is winter coming for martech? Or just for martech VCs? For the past 7 years that I’ve been tracking the growth of the marketing technology landscape, I’ve been hearing prophecies of its consolidation. I’ve been quick to acknowledge that’s a possibility, probably an inevitable one. In fact, if you look at the distribution of revenue across martech companies today, you can argue it’s already happened. But I’ve found it ironically amusing that, at least in the short term, the more predictions of consolidation there have been, the larger the landscape has grown. My meta-level takeaway: predicting the future in a complex environment is hard. That’s why I feel much safer playing the role of the empiricist — describing what’s actually happening today — than the prophet claiming to know what will happen tomorrow. And it’s why I encourage marketers to think in terms of optionality for their own marketing stacks. But there is a case for a coming “martech apocalypse” that I’ve heard from multiple sources — primarily people in corporate development who look at the martech landscape as a kind of M&A buffet — that I think could dramatically change the dynamics in this space. But not necessarily in the way they think it will. The premise is this: there are a significant number of martech companies that have taken large amounts of VC funding, their burn rate is much greater than their revenue, and the exponential growth curve that their VCs expected of them is flattening out. It’s important to note — and we’ll come back to this — that many of them are great companies, with amazing products and happy customers, continuing to grow. But not at the pace that supports the VC math of a 10X return. Therefore, they’re not going to be able to raise their next round of funding, and since they’re not self-sustaining with their cash flow, they’ll either be forced to sell to the hungry corp dev wolves or simply go out of business. Not only will that consolidate the landscape through mass attrition, the large number of VC write-offs that will occur will make the space radioactive to investors, so far fewer martech start-ups will be able to to raise VC funding in the future. The engine of growth for the landscape will grind to a screeching halt. As with so many other predictions in this space, its most glaring flaw is that it’s a gross oversimplification. It’s next-most-glaring flaw is that it conflates that needs of large martech VCs with those of martech vendors and martech customers. Now, as an empiricist, I agree that there are many funded martech companies that are not profitable today and are going to have a hard time raising large follow-on VC rounds because they can’t justify how they’ll deliver 10X returns at that scale on the timetable that institutional VCs have come to expect. That said, I’m skeptical of pretty much every other assumption and inference around that martech apocalypse scenario. The mother of all assumptions here is that you need large VC investment to grow a successful software company. Talk about an epic false dichotomy: either you can raise tens of millions (or hundreds of millions) and IPO to a billion dollar valuation, or you might as well not bother getting out of bed. Those are the only companies that matter to large VCs with gargantuan funds that have to deploy at least $20 million or more in a portfolio company to make their economics work. There will be some martech companies that fit that model. But doing the math on the total market, it’s obvious that there can’t be thousands of them. But thinking that those are the only kind of software companies that matter to everyone else in the world — the only kind of software companies that can be successful and provide real value to their customers — is a Sand Hill Road fantasy from one or two decades ago. It runs contrary to every other trend happening in software. So many big forces are democratizing the software business. On-demand cloud computing resources that continue to drop in price. An incredible array of open source software that lets any developer stand on the shoulders of giants — for free. The interoperability of APIs and microservices. Crowd sourced problem solving from expert communities around the globe. On-demand talent networks and dynamic group collaboration across any distance. It is truly astounding the software that people can build without a lot of capital today. A good friend of mine launched a software business a few years ago with a modest amount of angel funding, and through smart use of open source and Upwork-based talent has grown it into one of the leading vendors in their space. Organizations like the World Bank are their customers. They’re profitable, growing at a double-digit rate, expanding internationally, and innovating their industry in a myriad of remarkable ways. A competitive venture not too long ago raised north of $20 million in funding — and blew it all with almost nothing to show for it in the end. Not even a viable product. You might argue that stories like these are anomalies — and a couple of decades ago it might have been. But in the cloud era, I’d contend that this is likely to be a much more common path to success than the major VC route. David Heinemeier Hansson, or DHH as he’s known by short-hand, is a co-founder and CTO of Basecamp (formerly 37signals), the creator of the immensely popular open source web application framework Ruby on Rails, the New York Times best-selling author of Rework and Remote, and a regular blogger on Medium under Basecamp’s publication Signal v. Noise. Much of his recent writing on Medium is essentially antibiotics for the “must raise a lot of VC money” meme that has spread throughout the software start-up scene. Basecamp is Exhibit A for the alternative approach: a small, bootstrapped, yet highly profitable company, that customers love, and where employees love what they do (and don’t burn themselves out). “Another anomaly!” you say? Basecamp is the Steve Jobs of non-VC software success? Then read The Rise of Non “VC compatible” SaaS Companies by Clement Vouillon, who actually works at a VC firm, Point Nine Capital. “But surely all these small companies can’t compete against the giants? !” you might offer as a riposte. You need big companies with big funding to do big things, right? Not necessarily in a cloud-based software world. In addition to the economics of the democratization of software that we discussed above, increased “platformization” in the martech space is making it easier for more specialized solutions to plug into companies’ marketing stacks. The average enterprises uses 91 marketing cloud services (a) because they can and (b) because it lets them tailor their toolset to their particular needs and wants. They don’t have to settle for what one or two major marketing clouds think is sufficient for everyone. While you’re reading articles from folks who are much smarter about this stuff than I am, you should read 5 Ways to Compete With [Big] Incumbents by Steven Sinofsky. Small, focused, passionate companies can make software that people really love. I’m not saying that there won’t still be great ventures in martech that will be able to successfully leverage large VC funding. I’m sure there will be. But there will be many more martech companies that can leverage more modest amounts of VC capital, angel funding, incubator funding, venture debt, crowdfunding, vendor funding, customer funding, open source community funding, or — making a business the old-fashioned way — by entrepreneurs launching it with sufficient funding from their own pockets. So going back to that set of unprofitable martech companies today who find themselves being squeezed out of the next round of their fundings. If they’ve got great products and great customers — and many of them do — I suspect there are more possible paths forward for them than just deal-or-die ultimatums. Those other paths won’t necessarily be easy. They will almost certainly require them to significantly restructure their costs in order to become profitable. Some may have to explore more radical transformations, such as going open source. But those are options. And as is the nature with any business, a number of them still won’t survive. That may reduce the appetite for the kind of large VC investments in the martech space that we’ve seen over the past few years. But I don’t think it’s going to dampen the inventiveness of future martech entrepreneurs and the yearning for innovation from martech customers. But again, I’m an empiricist, not a prognosticator. This is just my hypothesis. We’ll see how the data plays out in the years ahead. Great post Scott! As you know I have lots of opinions on the funding and growth of the MarTech industry. When we started CabinetM and began talking to investors we routinely heard that we were solving a problem (finding and managing marketing tech) that within two years would no longer exist because the industry was going to consolidate into no more than five different platforms. That was in the simple days when there were only 750 products on your landscape. Surprise! That didn’t happen. Of course it didn’t happen!! 1)	There are a small number of companies that have the financial resources to be acquirers and even the largest of those have limits on how many acquisitions they can absorb in a single year. 2)	Even if by some unlikely chance the industry had consolidated, the price of the resulting mega marketing systems would have quickly become “out of budget reach” for the vast majority of companies. This, in turn, would have driven the next wave of marketing tech innovation, thus reinvigorating the landscape. 3)	Digital transformation, regardless of how you define, it is very much in its infancy. How many companies (users not vendors) have you met that have bragged about being at the forefront of digital transformation? Every company we’ve talked to in the last year was concerned that they were behind in their strategy and plan. One thing that is so exciting about being in this industry is the potential ahead of us for dramatic innovation. I love that we are talking about marketing of the future being perceived as a valued service and not a necessary annoyance. To get there we are going to need a lot of technology innovation. 4)	Even without the huge digital transformation mandate, innovation continues to happen at a rapid rate in response to consumer behavioral changes and expectations. When we started CabinetM, chatbots, augmented and virtual reality weren’t part of the marketing mix and marketers weren’t even sure how to leverage Snapchat as a marketing channel. 5)	The stack data we’ve collected at CabinetM from hundreds of marketing tech stacks shows that marketing stacks fall into the snowflake category: once you move beyond the core platforms that you’ve identified in your post, stacks look wildly different. As you would expect, some of this is related to company size, type, and industry. But it’s also related to organizational dynamics and the deeply intertwined relationship between marketing programs, technology and the internal technology proficiency of the marketing team. Today we have more than 7,000 products in our industry database and typically add 10+ each week. While some of those come from industry announcements, the vast majority are coming from users who are identifying products that they use in their stacks that we haven’t yet catalogued. Looking forward I’m very bullish about continued innovation but don’t expect to see an exponential increase in the size of the marketing landscape. I believe there will be some consolidation and companies falling by the wayside that are over capitalized, haven’t evolved with industry needs, or don’t fulfill a large enough need to support company growth. But, all in all, I think we will continue to have a large and diverse industry landscape. Ongoing landscape work for you every year! On the topic of VC funding and the MarTech industry – what a mess. While I agree that a lot can be achieved by bootstrapping and crowd funding, the reality is that big platforms need big dollars and we have a serious lack of early stage funding that allows innovative teams to reach tangible milestones to warrant full scale investment. •	The lemming approach to funding – a new category emerges with a super star anchor company and suddenly everyone is rushing to invest in new category entrants. While I believe that categories need multiple suppliers it’s hard to see why a category like CRM needs 50+ players. The stack data we’ve collected so far shows that CRM deployment is highly concentrated around a few key players with Salesforce and Microsoft Dynamics the most dominant. •	The Halo effect – investors rushing to invest in employees exiting successful startups. Somehow there’s a belief that if they were a part of a successful enterprise, no matter their role, they can bring that company’s magic to a new venture. Sometimes this works, but many times it doesn’t. Often, the genesis of the business idea is a missing feature that they identified while working for their previous company. The problem comes when venture investors skip the seed stage investment process that would normally provide just enough funding to determine if the problem is big enough to support a new business and just jump in with a multi-million dollar first round. I’ve seen plenty of these companies raise $5M – $10M on a PowerPoint presentation and then pivot within 12 months due to lack of market understanding and opportunity or collapse completely. •	The shiny new buzzword approach to investing – I’ve lost track of the number of time well meaning colleagues have told us to put AI into our pitch because investors expect to see it or have recommended that we create an AI category in our database. Marketers are not issuing RFPs for AI – AI is an enabling technology not a product unto itself. Marketers love buzzwords – we just can’t help ourselves. So, we propagate the problem by scattering everything we write with the latest buzzwords. First it was big data, then came machine learning, and now AI. Investors like marketers, quickly become enamored with the latest set of buzzwords and reinforce the use of them by gravitating to companies using them. To be clear here, I think venture capital firms like Glasswing Ventures who are focused on AI as an enabling technology and are developing a deep competency in the sector, bring tremendous value to a variety of industries including the MarTech industry. They are vastly different than the investor who is looking for the latest buzzword as a check-off item without understanding if it is a) real and b) meaningful to the business being pitched. •	Lack of willingness to fund women – marketing is one of a few industries that has been female dominant or at the very least gender equivalent. Women are starting MarTech companies but find funding challenging. A lot has been written on this subject lately so no need for me to dwell on it. •	Marketing Automation. This category is currently dominated by Marketo, Pardot, Oracle (Eloqua), and Hubspot. Our stacks data shows that it is not uncommon for organizations to have two different vendors in their stack. In our discussions with our users, we hear complaints about ease of use, lack of functionality and cost. I believe there is room for innovation here. •	Customer Data Management. The only path to true personalization is through a detailed understanding of each customer. Platforms that integrate customer data from multiple sources and intelligently manage customer privacy concerns and international regulations are going to be critical for any medium to large enterprise. •	Marketing Performance Management. This is a category that is still in its infancy, with many problems to solve. For marketers, attribution is an ongoing challenge and frustration; trying to get to accurate acquisition costs and customer life-time value calculations is a struggle. •	Interesting incrementals. One of the things that we don’t talk enough about is the amount of dark technology that exists within the marketing stack. This is technology that has been developed by enterprise organizations to address integration issues or failings in acquired products. There is a goldmine of useful information in understanding what enterprise organizations are developing themselves. We are just starting to catalog that in our database and don’t yet have enough information to share but I would encourage intrepid entrepreneurs thinking about MarTech development to dive in to identify trends and opportunities. The other area of tremendous incremental value is in ease of use – organizations are struggling with the complexity of managing and using their marketing technology systems. As you’ve noted, Scott, it’s not unusual to see more than 100 tools deployed at anyone time. The learning curve, the challenges of maintaining skill redundancy, and managing across multiple platforms is a nightmare. Anyone who can bring simplicity to this environment would be worth looking at. In the future: Looking ahead, personally, I would focus on products and technologies that advance the relationship between a customer and brand, and enhance the customer experience. Vague I know. I remember a conversation I had with my teenage son 10 years ago about Internet innovation. For arguments sake, he decided to take the position that there would be no more innovation. And while I could argue from a historical perspective about the pace of innovation, I couldn’t point to potential coming innovations. But there are those visionaries in every industry that can see the future. Marketing used to be a profession; it is only in the last ten years that it has become an industry. The Marketing industry is still in its infancy, and now is not the time to write it off as a saturated industry. Yes, we need some rationalization, but we also need more focused investment. I for one am hoping that there are some brave investors that will lead the way. My guess is that it’s just going to keep expanding. 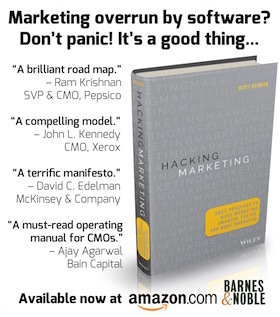 Consider this: how huge is the marketing industry is right now (including all the internal employees doing marketing)? As AI gets better and takes over more and more work, the potential grows to take a bigger and bigger role. Plus, we’re getting more and more comfortable handing over work to technology. Finally, here’s a thought experiment. Five years ago, you could have said that there’s too many SaaS companies and the space is saturated. The thing is that SaaS has continued to grow and shows no signs of stopping. Why is marketing SaaS any different?